Stand out among the crowd! The WQA Convention & Exposition sponsorship program offers your company strategic opportunities to effectively promote your products and services. This year’s program presents an array of sponsorship options designed to reach your target audience. Receive online and on-site recognition through the WQA Convention & Exposition website, Program & Buyer’s Guide, signage and announcements. 1. Increased exposure and awareness for your company. 2. More traffic to your booth. 3. Opportunity to strengthen your brand awareness with attendees and WQA members. 4. Reinforce your position as a leader in the drinking water treatment industry. Main Street WQA: A park-like walkway winding throughout the trade show floor will engage attendees with park benches, foosball tables, a golf simulator and other rest or entertainment options. Business Spotlight: Available on the tradeshow floor in 30 minute segments. You can use the time for a product showcase, a mini training session or an advertising opportunity. This will be advertised in the Convention Guide, Convention Mobile App. and on-site signage. Giveaways are allowed. A podium, microphone, screen and projector will be provided. The seating will be theater style and hold up to 50+ people. Time slots will be available on a first-come, first-served basis. SOLD Welcome Reception: Align your company with the largest social gathering by sponsoring the Welcome Reception that directly follows the close of the Exhibit Hall on the first day and its just steps away from the Exhibit Hall. Your logo will be placed on signage at the event as well as in conjunction with advertising for the reception. New Member and First Time Attendee Breakfast: Welcome WQA's newest members and first-time convention attendees. Your logo will be featured on signage and invitations. You will be able to personally welcome the guests to the breakfast. Choose from one of these highly visible opportunities to stand out. This includes but is not limited to floor clings, aisle signs, and banners. Possibilities are limitless. Please call for details. Program and Buyers Guide: Drive traffic to your booth and keep your brand top of mind during the show by advertising in the official Convention Guide. The Convention Guide will be distributed on-site and available online through the WQA Convention & Exposition website. 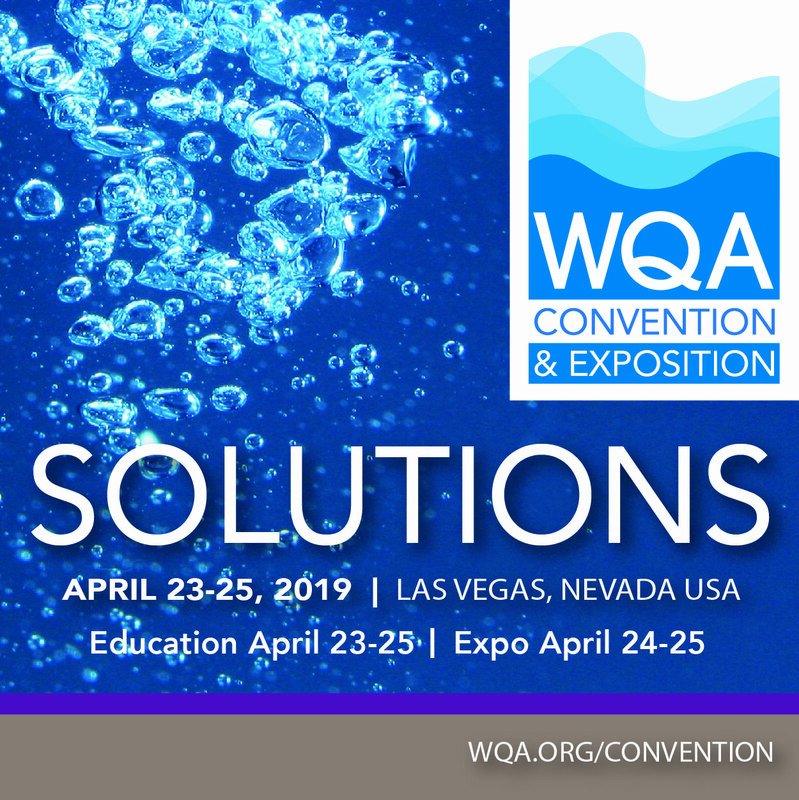 WQA ENews: A special daily edition sent to all convention attendees and WQA members. Convention Mobile App: Banner ad on the WQA Convention & Exposition app landing page which includes a direct link to sponsors' website. Company logo in the Convention Guide and on-site signage instructing attendees how to use the app. A sign with your company logo at the App Help Desk, a new feature for 2019. On-Site Registration: Your logo will appear on the screen saver that will be seen by attendees using the self-serve registration kiosks. Tote Bag Stuffer: Provide a one-page insert to be included in the attendee tote bag. Insert must be approved by WQA staff. Product Showcase: A full-color display panel to introduce a new product, innovation or service. A great way to gain visibility with buyers and media in high traffic area. SOLD Name Badge Lanyards: Company name and logo imprinted on the name badge lanyards. Design must be approved by WQA staff. Sponsor company to provide 4,000 lanyards. Tote Bags: Your logo along with the WQA logo on the tote bag provided to attendees at registration and at WQA Central in the Exhibit Hall. Notepads: Convention notepads will feature your company's logo along with the WQA Convention & Exposition logo. Notepads will be placed in the Convention tote bags. Pens: Provide 3,000 pens that have your logo on them. Pens will be in Convention tote bags as well as in classrooms, WQA Central, and the registration area. Private-label Bottled Water: Quench the thirst of attendees by providing bottled water with your logo on it. Coffee Service Sponsor: Provide attendees with a much needed jolt of energy. Your logo will be featured on signage where coffee is offered. You may also provide napkins with your logo. WQA will work with you to create a customized sponsorship tailored specifically to your company’s needs. Contact the WQA Convention & Exposition staff at hduve@wqa.org to inquire. • A company has the first right of renewal for a sponsorship for three years; after the third year, the sponsorship is available for 3 months for another company to purchase. If it is not reserved by another company, it can be renewed again by the first company.